Commuter (one weekend only): $895 Includes L&D, tuition. EARLY BIRD SPECIAL $100 OFF IF PAID IN FULL BY FEB 1, 2017 ! 90 days or more prior to the start of the retreat OR training, you receive: Full refund minus a cancellation fee of 20% of the retreat/workshop cost. the cost of the full retreat/training goes toward another Sage Center Retreat/Training within 12 months. 50% will be retained as a non-refundable cancellation fee. 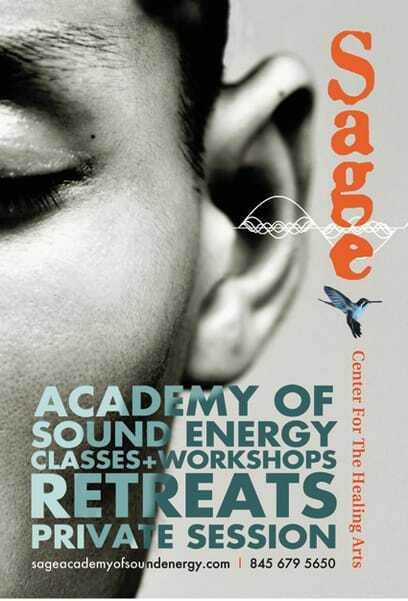 ​***The Sage Academy Of Sound Energy Certification Program Sage Academy Of Sound Energy offers a Certificate Program in Sound Healing -- the study of the effect of sound on human beings physiologically, psychologically, emotionally and spiritually. The Certificate program is a comprehensive curriculum designed to provide students with a broad perspective on this expanding industry, enabling them to focus on their areas of interest. ​ The Certification program gets you to the point where you can utilize a variety of SoundHealing techniques for your own practice as a Sound Healer. With a certificate from The Academy Of Sound Energy, students should be better equipped to serve as practitioners, specialists, volunteers, interns, or even as members of a multidisciplinary treatment team within a health center or a community agency, as well as in a private healing or counseling practice.